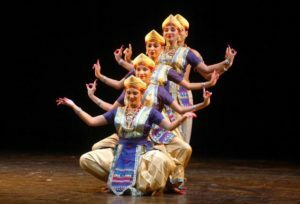 Sattriya is one of the eight major Indian Classical Dance forms. This conventional dance form came into being from Krishna centered Vaishnavism Monastries of Assam. Thereafter, Sattriya art grew as part of the Vaishnava Bhakti movement. Mahapurusha Sankaradeva, the renowed scholar and cultural genius was the founder of Sattriya Dance. Thus this dance form prospered and progressed under his initiation back in 15th Century. Sattriya was also considered as a powerful medium for propagation of the Vaishnava faith . The dance was an accompaniment to the Ankiya Naat. However, initially the dance was restricted within the boundaries of Sattras, the monasteries in Assam. In addition, this dance form was then performed only by the Bhokots( Male monks) as part of their daily rituals or to mark special festivals. With the passage of time Sattriya dance soon gathered popularity, hence emerged from the confines of Sattras to a much wider recognition. The dance recitals tell tales from mythology. Especially relevant part of the Sattriya dance is that, it is performed not before any idols but before a copy of Bhagvata Purana placed in eastern corner called Manikut inside temples and monastries. Sattriya dance consist of three distinct part- Guru Vandana, Ramdani and Geet Abhinaya. The first two is performed without any music and the third part is based on the childhood tales of Lord Krishna. Sattiya Nitrya is accompanied by musical compositions called Borgeets, which are classical based ragas. 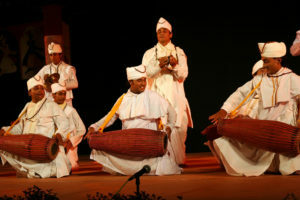 The instruments that accompany this traditional dance are Khols(drums), taals(cymbals) and the flute.